scales, you have to programme it for age, gender and height. And you have to decide if you are an athletic or sedentary person. How do you know if you are an athlete or a couch potato? percentages often add up to more than 100%. 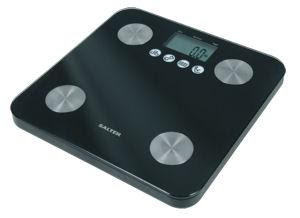 I contacted Robert Gates, the design and technical manager of Homedics, the company that designed the Salter scales and sought his advice. Gates: "The standard fitness level uses an equation that is derived from a typical group of individuals - i.e. tending to be relatively inactive. This equation was found to tend to overestimate body fat levels for individuals with a more athletic body composition. Therefore athlete mode was developed to enable the user to tailor the equation used to their fitness level." Gary: The most important point about this is to choose one mode and then stick to it. The equations are a compromise for simplicity of programming. Get too complicated and you would have to use a device that is hooked up to a computer. Once you are in athlete or sedentary mode, the machine is incredibly accurate - accurate to 0.1% which is astonishing. Gates: "The percentages are expressed as a percentage of the overall body weight. You may note that the figures do not add up to 100% necessarily - this is because muscle contains water and therefore there is some overlap with the body water percentage." Gary: There appears to be a near direct relationship between water and muscle percents and health. The higher they are, the healthier the person. Men and women are doing very well if above 60% water and 40% muscle. Regardless of age. Mind you it is harder to achieve as one gets older; but not at all impossible. With age we lose muscle, we get fatter and we dry out. Medications seem to accelerate these. Measures that reverse or slow these processes of weakening, fattening and drying out could be regarded as being anti-ageing strategies. The record so far for water is 73% achieved by a 28 year old male who is representing New Zealand at the World Mountain Running Championships in Switzerland. He has been consulting me, so is in excellent health and good running form - of course! Fat has little water in it, so a person with more fat tends to have less overall water. Women tend to have more fat than men and less muscle so their water content tends to be lower. As a man or woman improves their diet and exercise, fat percent should drop, muscle increase and water percent will go up. Tissue salt therapy appears to assist tissue hydration. Tip: A rapid and unexplained drop in lean muscle and water percents may be the first indicators of a serious illness, including undiagnosed cancer. If you notice a rapid loss of lean weight that is associated with unusual fatigue or pain it would be wise to consult a doctor - just in case. It could be a life saver.